During my career the focus will be on Chelsea but I will also try to give an overview of the other Premier League clubs and other leagues. The first transferwindow is off and in the post above I will continuously update the current squad. If you have suggestions for transfers feel free to tell me. Chelsea has shown they are one of the most up and down teams in the PL. Personally with there team and financial backing they should always be top 3. I agree they need a creative midfielder. Nabil Fekir has been heavily linked since his failed move to Liverpool and you also need to find a replacement for Willian on the right. Guy is just to inconsistent. CHO is a true young talent though an DOF it wasn’t for Hazard being there would probably be mentioned in the same breath as Rashford. Not the biggest Chelsea fan, as you can guess, but good luck with the story. Willing to see how it develops, as you say that you're going to introduce a different concept. On transfers, I guess you have lots of funds to try to sign whoever you want. Personally, I like when the stories are realistic in one way or another. So this is your choice, according to your own rules. I don't follow the day by day of Chelsea so close to say anything. Thanks for your suggestions, a creative midfielder could be a welcome addition to the team. Will keep an eye on the names you mentioned. Pulisic will join after the first season but CHO will definitley get his chances, I think he could also play together with Hazard (CHO at cam or on the right). I'm also not a Chelsea fan but I think Chelsea is one of the few top teams in the Premier League where it's able to make some big improvements/chances. I also like to add some realism into my careers, but I found out it's hard to do this in Fifa because other clubs make very unrealistic signings. Cannavaro would fit well at Chelsea, they have a history with (successful) Italian managers for sure. I'll wait for the squad updates of tomorrow (hopefully all the transfers have been updated by than), so in a couple days the first matchreports can be expected! Good introduction... a couple of things. If I'm not wrong, Porto eliminated Deportivo in the semis of the UCL that they ended up winning. I'm saying this, because it was a great robbery at Porto against Deportivo, with a red card for Andrade that I'll never forget (probably Mou did). I don't remember the other semifinal, which involved Monaco for sure (as they were the finalist), but can't remember if it was Chelsea the ones who faced the French. Then I have very fresh the Chelsea-Barcelona match and the Obrevo polemics. The reality is that I remember a clear handball by Piqué at some point, but Chelsea protested every single action inside the box and some of those 4 or 5 penalties they talk about were nothing or at least not that evident. What they never say is that Abidal got sent off and they played against 10 for 40 minutes. I think the 2nd card was deserved, not so much the first though. @subpop I checked it and you are right, Deportivo faced Porto in the semi-final. The other semi-final was between Monaco and Chelsea, the French won 5-3 on aggregate. About the Barcelona-Chelsea game, I didn't have the match very fresh so I watched some match summaries after your reaction. I think some penalty claims could have been heared but I understand not all of them were given. Especially Pique's handball and the faul of Abidal on Drogba (Abidal disturbed Drogba's balance when he wanted to shoot) should have been rewarded with a spotkick. But I agree the reactions of the Chelsea fans are out of proportion. Great write up. Pretty crazy how much Chelsea was transformed under Abramovich. I've updated the squad in the post above. 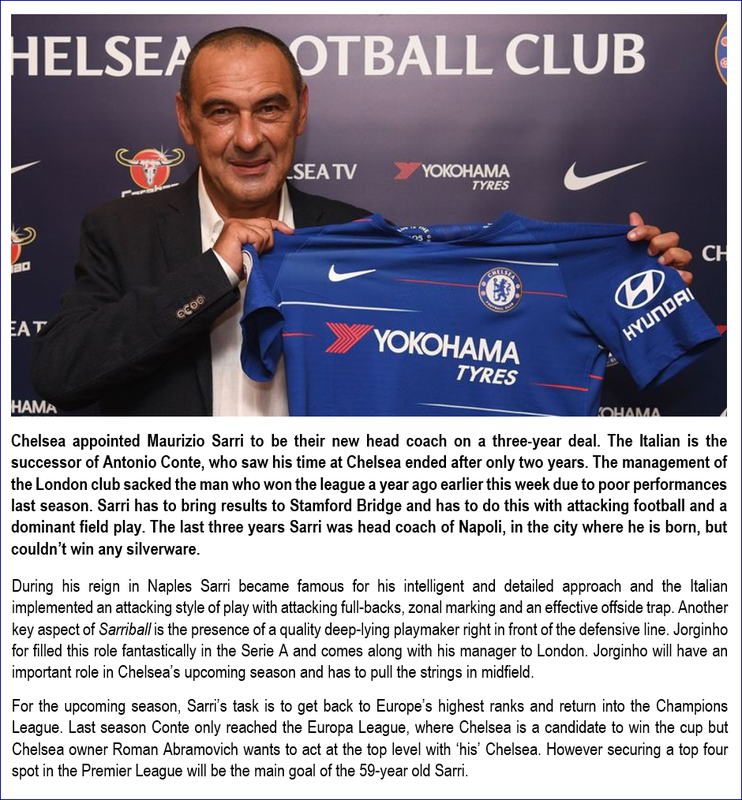 I want to do an interview with our new headcoach in the afternoon or tomorrow, if you have questions for Sarri feel free to ask. 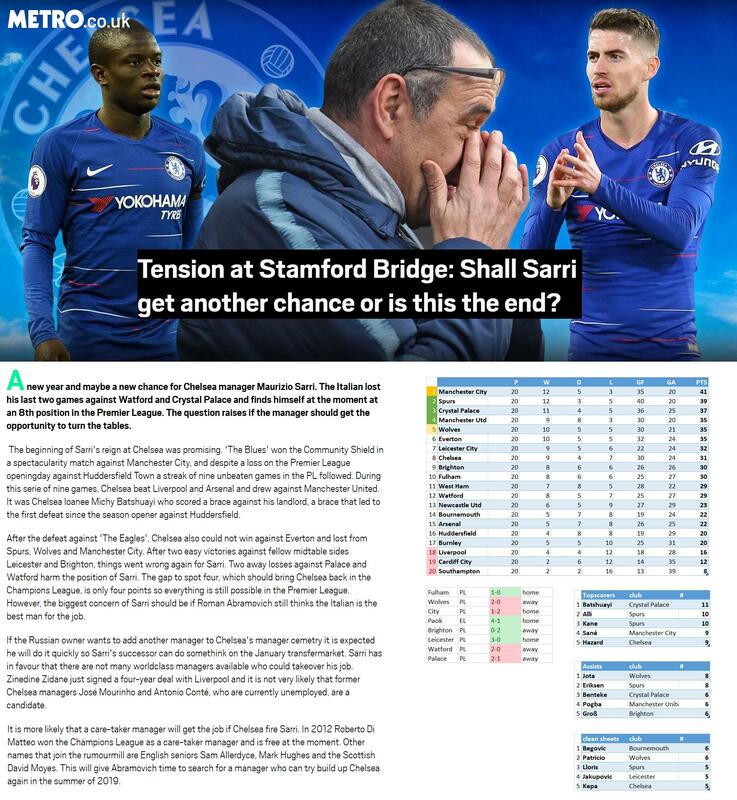 Jdb @ Bt sports "Sarri, with such a largesquad, are you planning on selling any starters or players currently on loan? Are you concerned with not being able to sign anyone due to squad limits? Diario Marca- Mr. Sarri: Hazard has been linked with Real Madrid. Which is your position in this issue? Is there any contact to renew his contract? 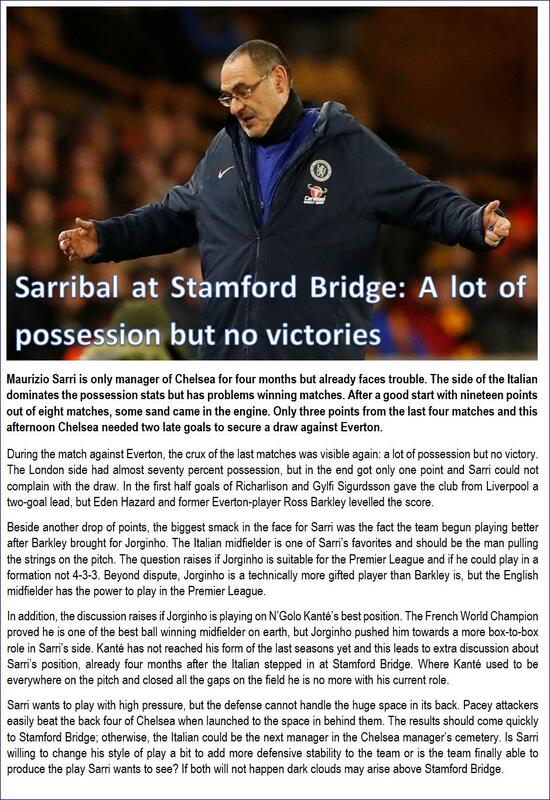 Jason S- Bleacher Report- Mr. Sarri your coming to a club who’s owner is notorious for demanding excellence at all times. Managers with more impressive records than yours have been let go recently. Does it intimidate you at all knowing that the slightest slip could cost you your job? @Wyojasond @subpop @JDB44 thanks for your contributions! 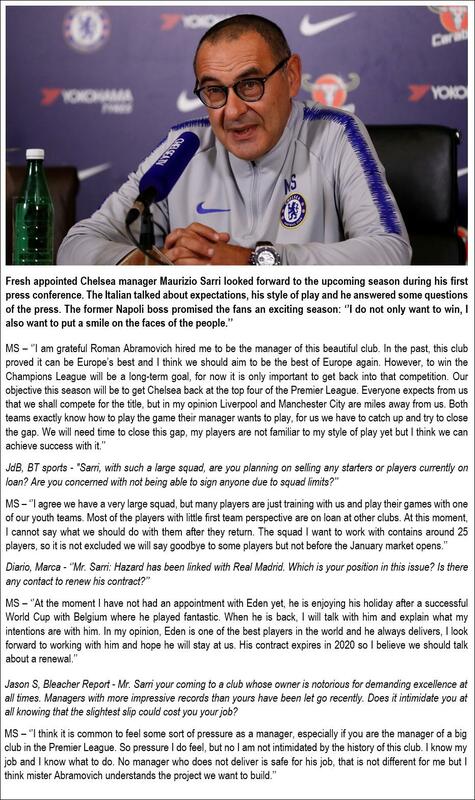 Now it's time for Sarri's first press conference. For the first season I will quickly go through the matches and give updates of a couple months. In the second season I think I will post more updates on specific matches. Watching Chelsea v City is the wrong match to be watching while reading this thread... good luck. 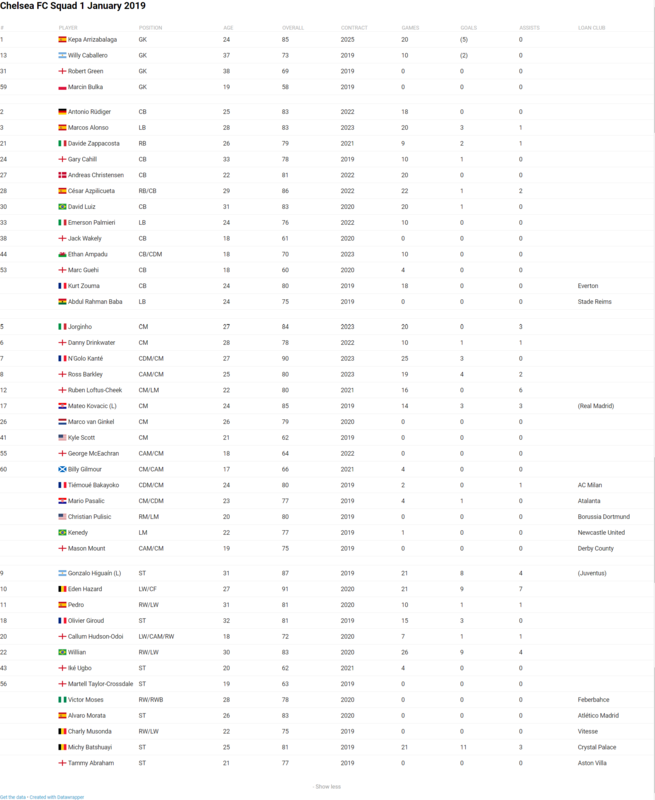 I also updated the squad stats above and included the games played, goals scored and assists provided by every player. Leicester in second and Liverpool in 17th 😂 Fifa just hates the Reds. Lol. Only 9 points between 1st and 8th so still a lot to play for. 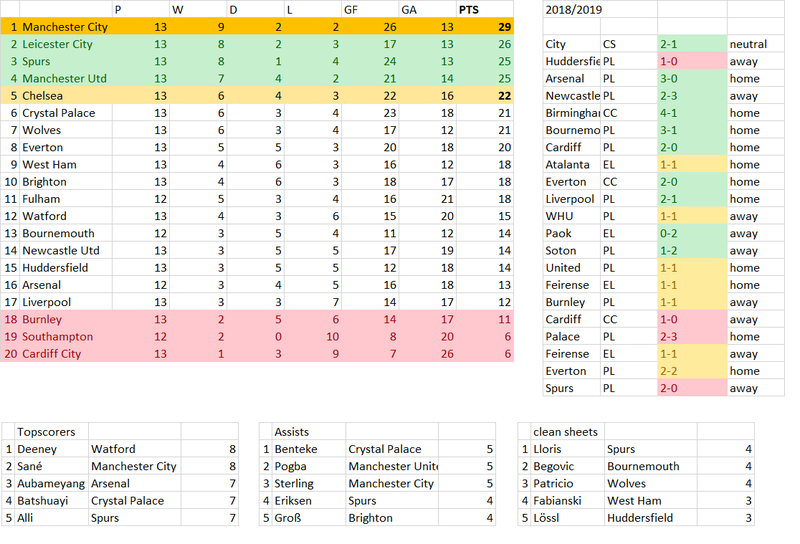 After a very good start, including the Charity Shield title, the last few games show a weaker Chelsea, explaining the current position of the team in the league table. Soon in the season, so nothing is lost yet, but the team must recover their early form... and soon! Great SkySport graphic! Bats would be a fun player to give a shot with at Chelsea as he has the skills to be a good player. Poor Klopp, EA hate Liverpool this year it seems. It would be terrible to lose such an important prospect. Sarri must find the way to give him more minutes. Odoi is a special talent. A team like Bayern doesn’t offer that kind of money for him if he isn’t. Hopefully Sarri puts him to the test soon. 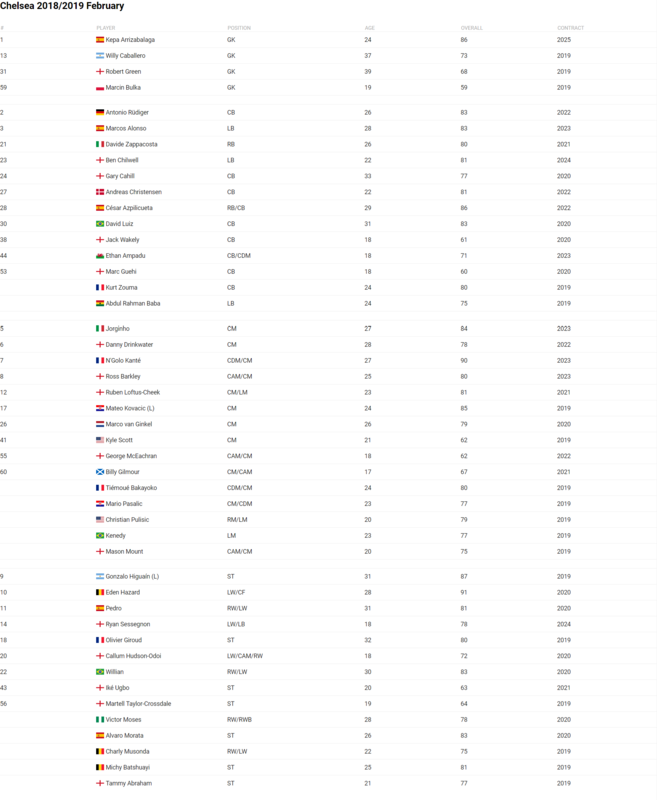 We are in January 2019 at the moment, so the transfermarket is open. I updated the squad above and one of the most important things is the renewal of David Luiz, the Brasilian signed a contract until 2020. What do you think Chelsea should do? Keep or sack Sarri?